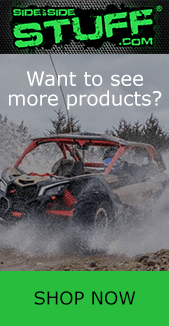 Whether you’re trying to make your side by side street legal, looking to give it some style, or simply just want to see behind you, a set of UTV side view mirrors can be a great addition to your machine. At the 2017 Sand Sports Super Show, we stopped in on our friend Mike from Axia Alloys. Mike was excited to show us their 6” Folding Side View Mirror for UTV’s. A king of quality, the Axia Alloys 6 Inch Folding Side View Mirror features a flat glass mirror in a strong billet aluminum housing with adjustable pivot points. The pivot points allow you to adjust on the fly as well as allow the mirror to fold back if it gets obstructed. Sold in pairs, these mirrors come in 3 finish options: Satin (raw aluminum), Bright Black Anodized or Bright Clear Anodized (silver). Furthermore, this product is backed up by a life time warranty.